I had been mulling over this event for months prior, as this is a unique experience. The purpose of the race/march is to honour those Filipino and American service members who were captured by the Japanese in April 1942 after the fall of Bataan and forced to march approximately 70 miles to a POW camp. The Allied forces were told if they could hold the area for two months, reinforcements would arrive. At five months, no reinforcements were in sight, and General MacArthur had been told by President Roosevelt to evacuate to Australia to avoid capture. At the time of surrender, these service members were already on half or quarter rations from the five-month battle in the area; conditions quickly got even worse. The Japanese forced their prisoners to march without food, water and medical care for five days. At the beginning of the forced march, there were more than 70,000 prisoners; along the way, more than 10,000 died. Prisoners who fell during the march were shot or bayonetted – just to ensure they were dead. Some were simply run over by the Japanese tanks and vehicles. One survivor told of an American POW who tried to escape. He was caught and beheaded in front of the prisoners, his head carried on a pike, to show what would happen if others tried to escape. Then the horror of being a POW began. Horrid conditions in camp, starvation disease, forced labour, terrible treatment. Survivors of the three-year ordeal were extremely malnourished and weak upon their liberation – some weighing around 80 pounds and needing serious rehabilitation before being returned to their families in the US. 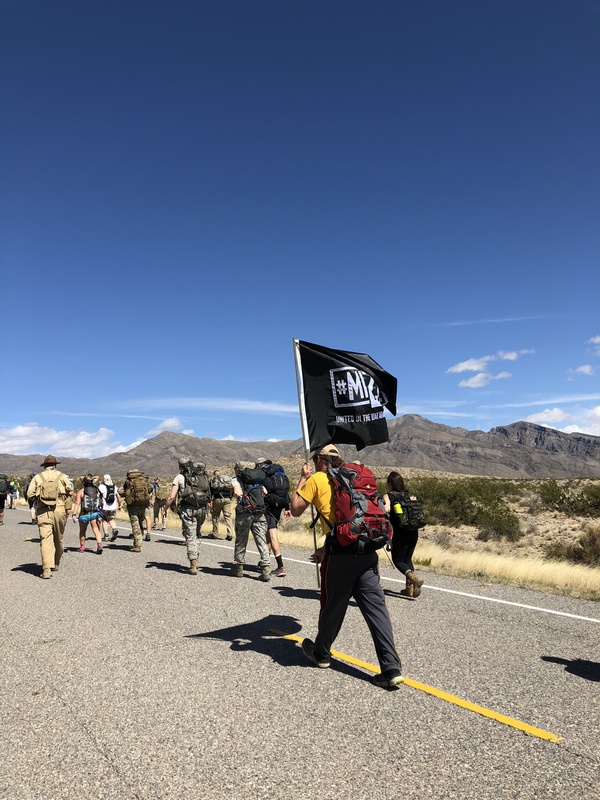 The Bataan Memorial Death March has now been held 29 times, and it is in New Mexico at the White Sands Missile Range because a disproportionate number of the American prisoners (approximately 1800, I believe) were from the New Mexico National Guard. This affected the area in a significant way. People here are passionate about honouring those who were a part of the Bataan Death March – whether they survived or were lost. One of the reasons this is a special race is because survivors from the march in 1942 attend the event. They spend time meeting with the marchers, attend the opening ceremony, shake hands of the marchers, tell their stories and they greet marchers as they cross the finish line. They are few. They are getting old. 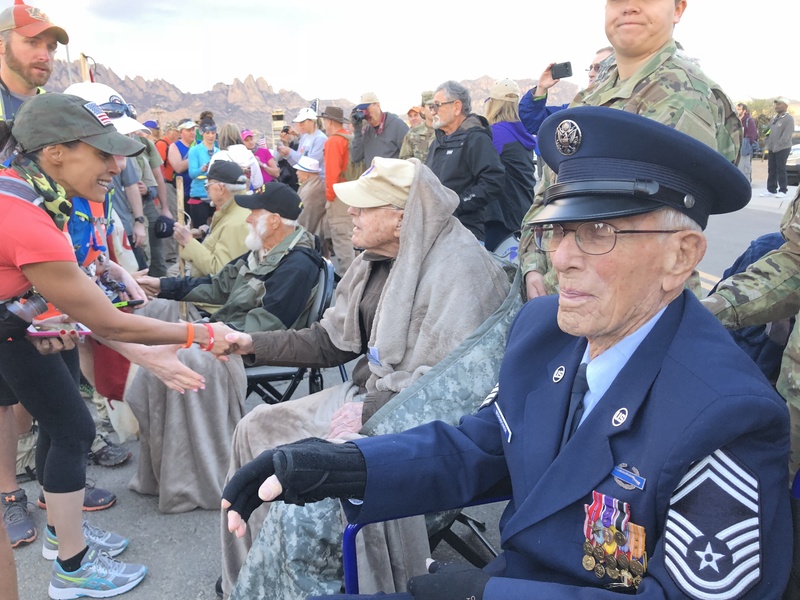 One survivor, Ben Skardon, is now 100 years old; he walked 8.5 miles of the course, making him the only survivor participating in the event. But there are others who are there to keep this chapter in history alive to a new generation of US military and participants. Which is a truly special thing. 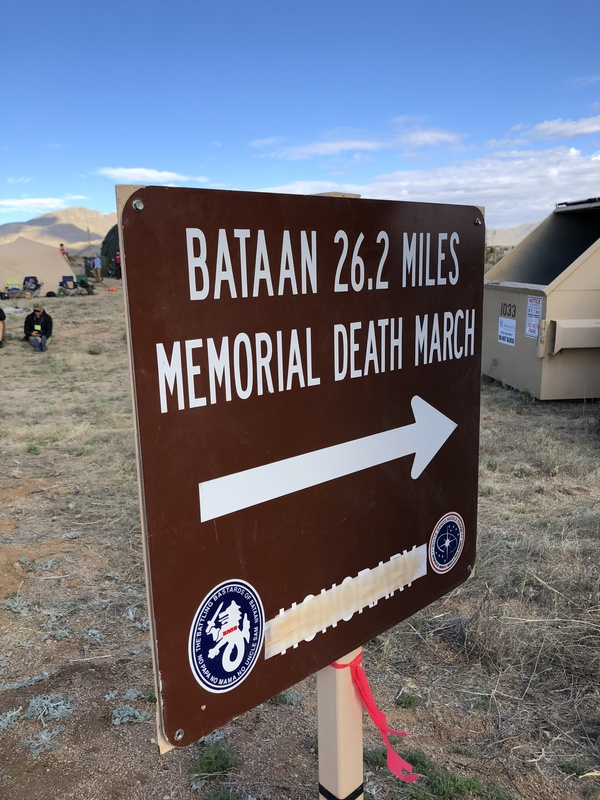 At the 75th anniversary of the Bataan Death March (2017), the highest number of participants attended – more than 7300. That was surpassed this year with a total registration of 8400. And a new route (this factors into my experience). I understand that last year, many family members of the Filipino survivors attended on behalf of their relatives. I noticed a large handful of Filipinos in the corrals this year, too. This event includes and honours both nations that lost service members, something that is significant given that most of those who died on the forced march were Filipino. If you plan to participate in this event, you will need to do a bit of logistical planning. The nearest major airport is El Paso, in Texas. The White Sands Missile Range is about a 90-minute drive from the airport. The closest major town is Las Cruces, where there are some reasonably priced hotels, and it is only about a 20-minute drive to the base. (I also think there are IHG hotels on the base, but I’m not sure how much they cost.) I was fortunate enough to meet a wonderful person in a training group for this event, who so kindly hosted me for the weekend – driving, giving me tips and suggestions, even putting me up for a few nights at her house. I was all set on the logistics front, thanks to my new friend Robin. Take your pick of what level of pain…I mean ENJOYMENT you want from this experience. If you are military or retired military, you can march in full uniform (must sign up as a military division). The course closes at 8pm, so you have a very long day to complete your journey. Packet pick up is on the base (have your ID with you to get on the base! ), and we went Friday to avoid the rush. In your packet, you get a shirt, dog tags (this is essentially your medal for the event), programme and a certificate of participation. They have the opportunity to have your certificate framed at the expo area for $65, and it takes about 2 minutes. Map of participants. From all over the world. Lots of great merchandise, a map where you could place a pin to mark where in the world you are coming from, and a table where marchers could meet and talk to survivors of Bataan. You could also get a bib with a fallen soldiers name on it to wear during the event. Given that I ran for Sgt Jayme Pohovey, I had my back bib already sorted. Packet picked up, we headed back to El Paso for the night. ** If you stay close to the base, you can attend talks by the survivors, screening of a movie about Bataan and other historical talks. Being in El Paso, the drive was a little too far to go back out for anything else. Robin, Bethany and I stayed at the Super 8 in Las Cruces the night before the race, so we could get a 4am start so as to not have to deal with crazy line up of vehicles getting onto the base in the morning. The hotel started breakfast at 2am due to the schedule of their weekend’s clients. We drove the 20 minutes and had little issue getting a great parking spot. Then we sat. For a long time. And tried not to drift off to sleep. We made a quick port-a-pot stop around 5am, before the lines got long and headed back to warm up in the car. The weather was cool in the morning (mid-50’s) and got warmer as the day went on. The highs were in the high 70’s and winds started light in the morning, reaching speeds of more than 20mph in the late morning/early afternoon. Apparently, the typical spring weather for this area. Around 6am we headed for the corrals; the opening ceremony was meant to start at 6:30am. There was no corral for runners, even though the start area map showed a corral in the back of the field. So we all just hung out, hoping we were in the right spot. At about 6:45, the opening ceremony started, complete with the national anthems for both the Philippines and the US being sung beautifully, recognizing both nations that suffered in the Bataan Death March. It continued with a blessing by the chaplain, a symbolic role call of survivors (I believe that seven were actually there at the event), an F-16 flyover and then the start of the race. They allowed the Wounded Warriors to start first, followed by the runners, then continuing on with the light divisions, heavy divisions and finally the Honorary marchers (14.2 mi). Prior to crossing the start line, there was a survivor meet and greet area, which allowed participants one other chance to meet the survivors who attended. Those poor men had to shake literally thousands of hands, and they were so awesome about it. They all looked fantastic for being in their 90’s – and one being 100! Survivor meet and greet area at the start of the March. Wounded Warriors started first. Impressive to see so many like this taking to Bataan. Old Glory being carried on the Bataan Memorial Death March. I got a decent start, cranking out my first mile in an effortless 9:30 and getting warmed up. 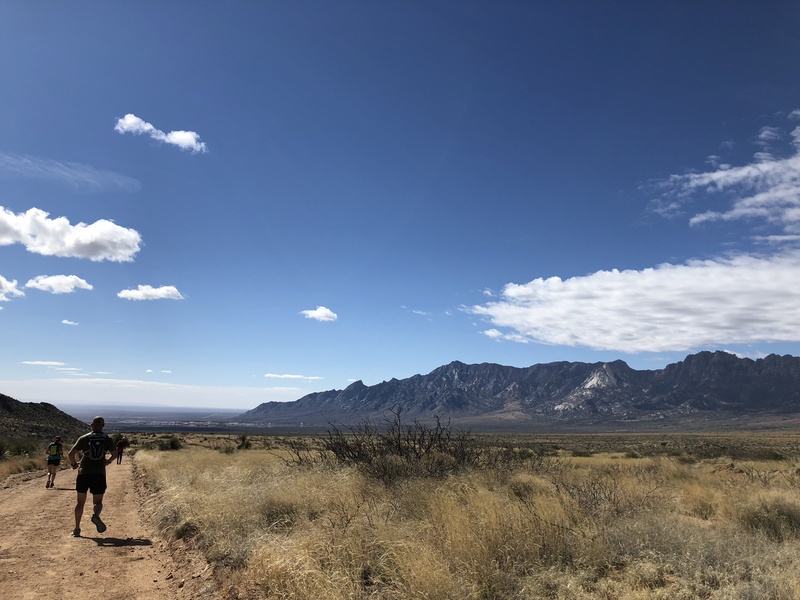 I knew the course ahead would be challenging, with sand and dirt paths to run (very little road running overall), higher altitude than I am used to (4300-5400 ft), hills, strong winds, relentless sun. I wanted to get in some good miles at the start when it was cool and the clouds were blocking the sun – and the wind hadn’t yet picked up. I was cruising along when all of a sudden, I saw a huge group of runners running back towards up yelling ‘turn around’. Another man yelled ‘congratulations on your first ultra marathon today!’ Apparently, we missed the cut off, and we now had to find where that was and make it back to that spot to pick up the course. After doing a little bit of walking through the brush (probably a stupid idea given that there may have been rattlesnakes and other dessert critters waiting for us), we got back to a road and continued looking for the course. We finally found it – and all the walkers on the now narrowing road. I saw the 2-mile course marker and looked at my watch – I was at 3.7 miles just 2 miles into the event. Of all the things I imagined going wrong (snake bites, cramping, rolling my ankle, dying), this was NOT one of them. Colour me unimpressed. Because they changed the course this year, experienced participants were going along the previous course. There was little or no marking at the missed turn, and there most certainly was not a race marshal to direct people the right direction. I guess at some point they got a marshal out there, but it was clearly after I went the extra distance. (I later heard the winner of the whole race ran NINE miles extra when they found him and took him to the start again. He proceeded to then run the 26.2 miles at an average pace of 5:30/mile I believe). Welcome mist station around mile 9 and 19. So thankful to see this! I was pretty annoyed by this, knowing it was sapping my energy just doing extra running, bushwhacking and then dodging in and out of people for another two miles until I got ahead of most walkers and the course opened up again. Then I thought about the irony of it; how I was there to honour those who were forced to march without food and water to an unknown fate. I mostly got over it for the rest of the run, choosing instead to have it as a funny story for this event. 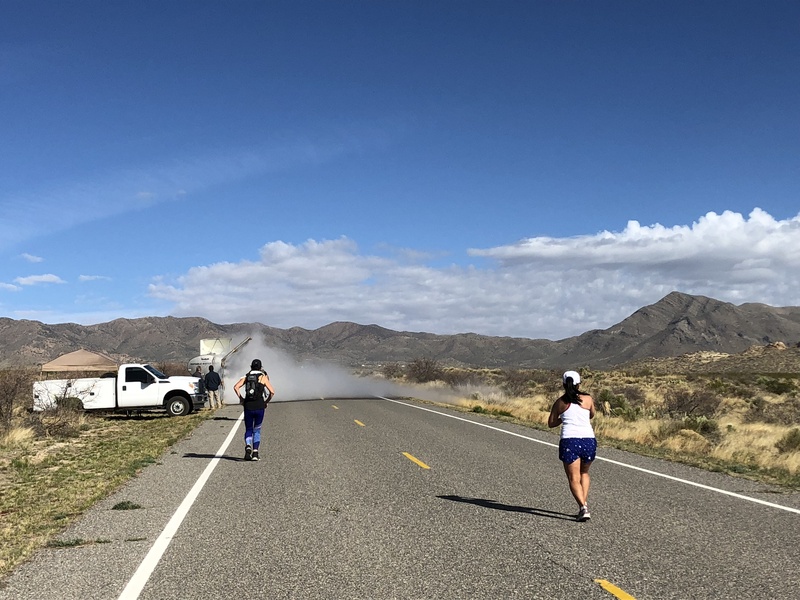 Let me say that there is a big HUGE difference between training at sea level in Cayman on flat surfaces versus running through the mountains of the high desert in New Mexico. Then starting around mile 5, the course began a steady incline, which lasted until past mile 13. So eight miles of straight uphill (seriously, there were NO downhills in this stretch). My uninitiated legs were already feeling the burn, so I chose to start a run/walk interval plan at least until I got to the highest elevation and we started going downhill at some point. Aid stations were plentiful – on average at every two miles or so. There was also meant to be a burger truck at mile 14, but I didn’t see (or smell) it. I did run through there at about 10:30, so it may have just been too early. But people raved about it in the lead up to the event. (Bring cash, and they did run out last year I heard.) All aid stations had water and Gatorade; many also had bananas and oranges. The medical assistance was plentiful and obvious. In addition to the medical points at specific aid stations, trained personnel drove ATV’s along the side of course helping people as needed. The course was really beautiful. The clear, sunny day and amazing visibility made it a breathtaking experience – especially when we made the turn around the mountain and started heading back to the base on the back half. You can see for miles. And of course, what that also means is that the base looks much closer than it really is…so my advice: just enjoy the scenery and keep putting one foot in front of the other. I got to my half way point (about 14 miles) and I still hadn’t arrived to the actual half way of the course. 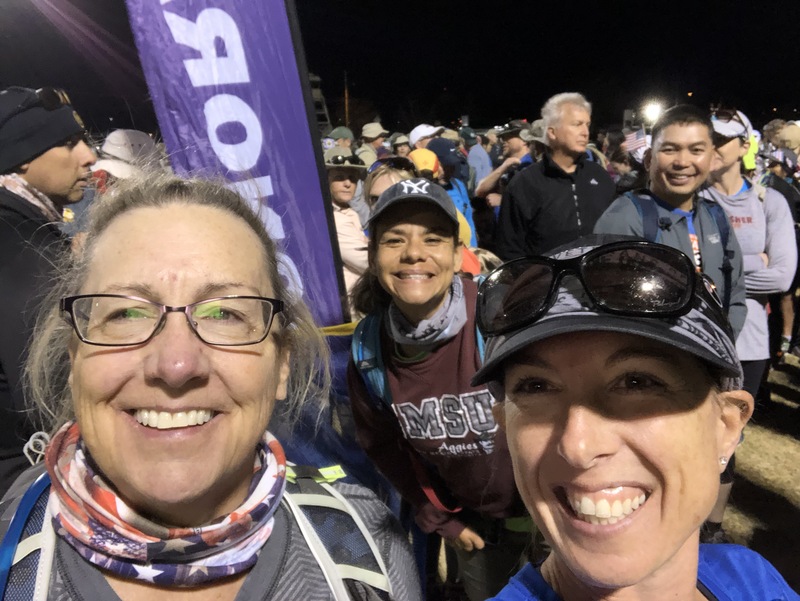 My legs were tired from the constant uphill and trudging through stretches of sand, which I kept weaving from side to side in an effort to find the hardest pack I could – then having to do it all over again. Once I saw the first glorious downhill section, I took off running again, enjoying giving my glutes a little break and letting gravity help me continue forward at a faster clip than I had been going. The downhills didn’t seem to last as long as I had hoped, unfortunately. At this point, people around me were starting to cramp up and have issues. I did take some extra salt with me, so I had that to give out as needed, which I think helped three people. I shared some water with a young cadet and gave some encouraging words to others. I felt pretty good overall, other than just being sore. There was one woman with whom I kept playing leapfrog; she saw me at the end and congratulated me, saying that she used me as inspiration to keep pushing as hard as she could. Funny, I said the same about her! 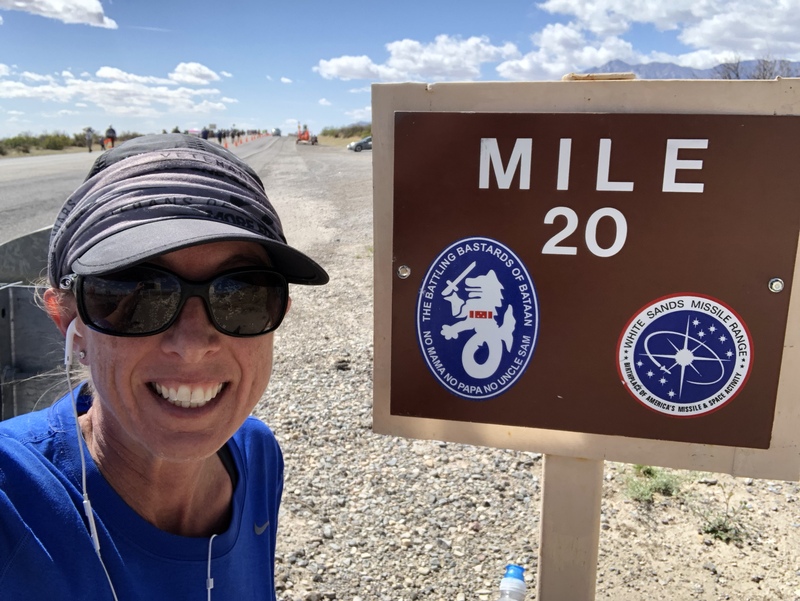 Reaching my favourite spot – mile 20! The stretch from miles 18-20 takes you along the same road as miles 8-10, which means we saw people still walking up towards that half way point. I’ll admit, I felt for them. The sun was pretty relentless (I did stop and put sunblock on my arms at the 20 mile point) and the winds were starting to pick up. As I headed down, the winds were somewhat at my back, which meant that those heading up had a bit of a headwind. Many were carrying flags of some sort, which meant their day was even more difficult. I offered cheers of encouragement to a few and continued on towards the dreaded sand pit just after mile 20. The sand pit. If your legs weren’t already jelly by this point, they would be afterwards. Almost a mile of 1.5 inch deep sand to run through. It was hard enough at that point, but to make it even more difficult, we faced at least 20mph sustained headwinds through this stretch. At times, I felt like I was barely making progress, it was so difficult. But I pushed through, knowing it would eventually end and I would be in that final stretch, which was mercifully pretty flat and almost all hardpack dirt or gravel trail. Around mile 25, I ran past my friends Robin and Bethany, who noticed me and yelled ‘there she is!’ I turned around, and completely in a daze waved and continued on. I probably should have stopped and chatted for a minute, but I was ready to be finished, especially since by my actual running that day, I had already completed a marathon. I was willing myself to run that last bit, and I was successful at it. In the final 100 meters, a guy in front of me had to stop because of a bad cramp he got in his calf. I felt for him. So close to the finish – yet so far away! Taking a moment to thank Harold Bergbower for his service after finishing. I ran through the final chute, which was lined with spectators. 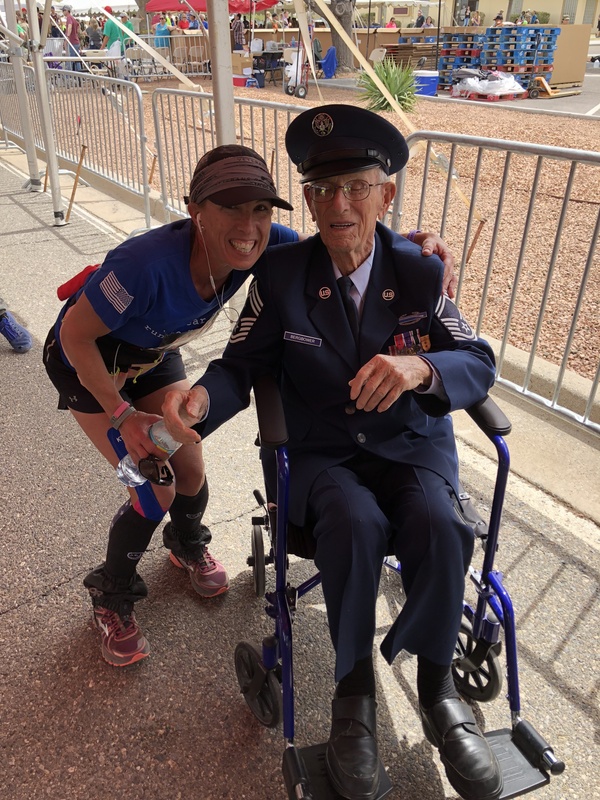 I crossed the line and was able to meet and have a photo taken with one of the survivors, US Air Force Chief Master Sgt Harold Bergbower. With all things considered, I was thinking it might take me 6+ hours to complete the course. My final time was 5:39:39 (which included at least 20 minutes due to the additional 1.7 mi distance I ran at the beginning). I’m happy with the effort, the results and the experience. After finishing, participants can go into the food hall for a free meal of ‘a protein, three side dishes and a drink’. There was beer as part of the drink option. I happily grabbed some chips and a Shiner (foregoing the main course as I wasn’t ready to eat heave food at that point) and went to sit and share experiences with Robin, Bethany, Anna and Rob, all of whom had completed the honorary. We enjoyed the chance to finally sit down, drink something other than water and share in some laughs about our time out there. We knew at some point we would have to stand up again and walk to the car; we delayed as long as possible. S’mores dessert thanks to Robert at Toro! They did have a survivor ceremony at 3pm, but we left before then, given that we had a long drive back to El Paso. I will definitely be looking up the video of this online. After a short nap and shower, I was ready to join the others for dinner. We went to this great place called Toro – good local beers and our server was awesome. He bought us s’mores dessert (you literally make your own s’mores at the table!) as a congratulation on our finishes. One day out and I am very sore in my hamstrings and glutes. But I’m wearing my Bataan dog tag today with pride, because that event is one of the most patriotic events you can take part in. The sheer respect for those who were part of Bataan in 1942 is evident by the level of military participation – many in the heavy division. Watching wounded warriors walk over rough terrain such a long distance to honour others is a sight to behold. They know it isn’t easy, but those taken prisoner so long ago didn’t have it easy, either. And I think that is what keeps people coming to participate in this event – showing a small level of understanding for what they experienced during their service to the US and to the world. Bring sports sunblock. Use it. Bring salt tabs, packets of salt, etc. And bring some extra because you will see others who need help. As I contemplate this, I wonder what these survivors think of this event. That people willingly ruck or run a significant distance over rough terrain? Why would anyone do this? Why do they want to remember such a horrible part of history? Why should the survivors relive their experiences when so many of them probably just wanted to forget? I know they appreciate the bit of celebrity they have as a result of this event, where people recognize their experience, keep the history alive so we don’t forget what happened in the past – lest we have to repeat a dark chapter ever again. But I think they appreciate the opportunity to know that their surrender at Bataan was not shameful in any way (as many of them originally felt) and that the marchers in this event allow them the chance to speak about their experiences, giving a voice to their stories and essentially their strengths. Because people didn’t survive three years of being a POW in horrid conditions without serious grit and determination. May they all have many more years to return to the Bataan Memorial Death March and speak to even more marchers, providing that first-hand experience to yet another generation of our country. Next year’s event is 17 March 2019. Registration should open in the fall. For more information, visit http://www.bataanmarch.com. I was happy to be your host for the weekend. This is a bucket list item in my opinion either by walking (rucking) or running and in doing the 26.1 miles last year and the 14.1 Honorary this year, I am still humbled by the experience. Thank you again for your fantastic hospitality, Robin! I had such a great time, and if I can do this again, I will! Definitely worth the experience – walking, running heavy or light. It’s an amazing way to connect with that chapter in our history. Enjoyed your story on Bataan.It is an incredible experience to do this race. Like no other race – with the amazing respect for our soldiers past and present. I have done the full and and 1/2 marathon. I’m glad to hear they are letting the runners start earlier in the event. 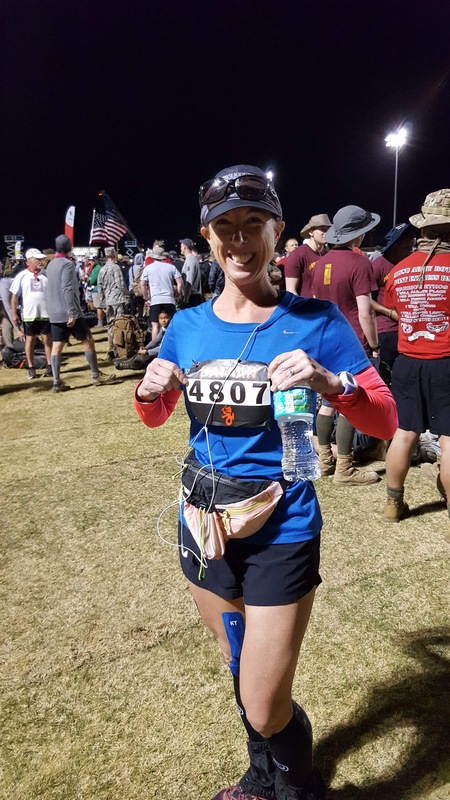 When I ran the race a few years ago, all the civilians – including runners, started after the military and I spent about 6 miles working my way through very crowded dirt roads. I highly recommend this race to anyone who wants a serious challenge. Glad you like my write up. It definitely was a special experience. I am so glad I did it, and I will continue telling people that if they have the opportunity to do this event, they shouldn’t think twice about it! Yes, it was hard, but well worth the effort – and since you seem to have had a more challenging experience & still recommend it, that is a huge vote of support for this event!